This post is used to create a web poster that displays the current Twitter stream for Ilan Tochner @Kitely. The web poster is available on Cookie II. That poster should be free to copy. Feel free to take a copy and use it as you please. 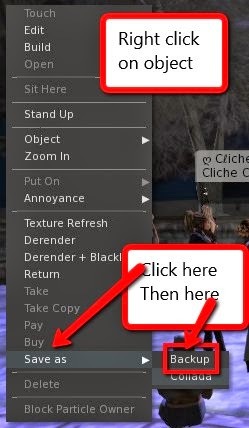 You can change the script to show any ordinary web page, including those that show videos. 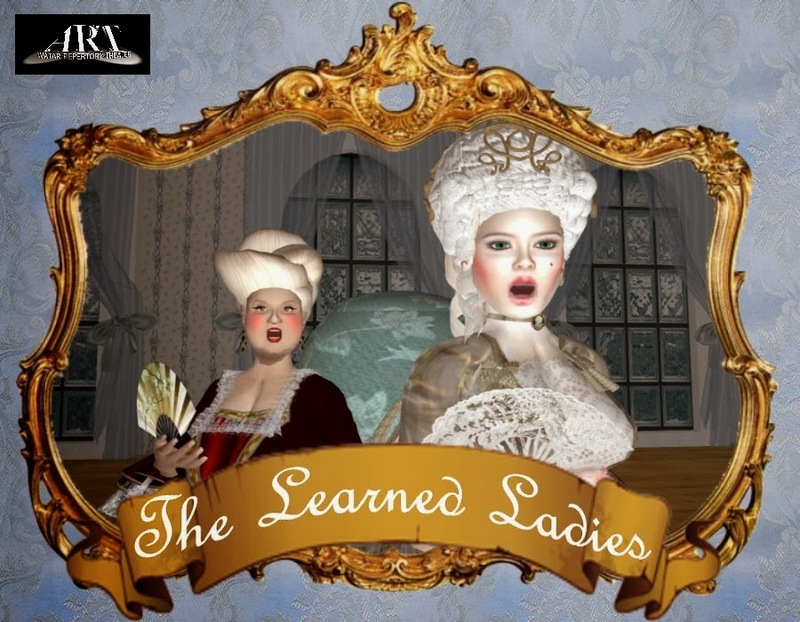 Hapless husband, Chrysale; over-bearing wife, Philaminte; dotty Aunt Belise; self-aggrandizing pendant, Trissotin; haughty Armande & sweet Henriette and more wacky characters from Moliere will romp across the stage in the Avatar Repertory Theater's final installment of "The Learned Ladies." MadameThespian Underhill directs and acts with Breyda Adored, Corwyn Allen, Em Jannings, Kayden Oconnell, Rowan Shamroy, Caledonia Skytower, Sodovan Torok and AvaJean Westland. Come and see the final outcome to this hilarious farce on Friday, Jan. 31 at 5 pm. Art Plays Around is a project of New Media ARTS, Inc. The entire play has been presented by ART in several segments, all at ART Plays Around. Avatar Repertory Theater is a project of New Media Arts, Inc., a nonprofit organization tax exempt under IRC 501(c)(3). Donations may be tax deductible depending on your tax jurisdiction and circumstances. If you want to sell exclusive rights to videos done in SL, check the TOS. Writers and videographers (people who make machinima) are the first to have been affected by the new Terms of Service established by Linden Lab in August 2013. These terms might be interpreted to apply to any video produced in Second Life. The terms do not specifically mention video production, but they do mention "derivative works." 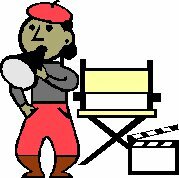 Video productions could be regarded as derivative works. 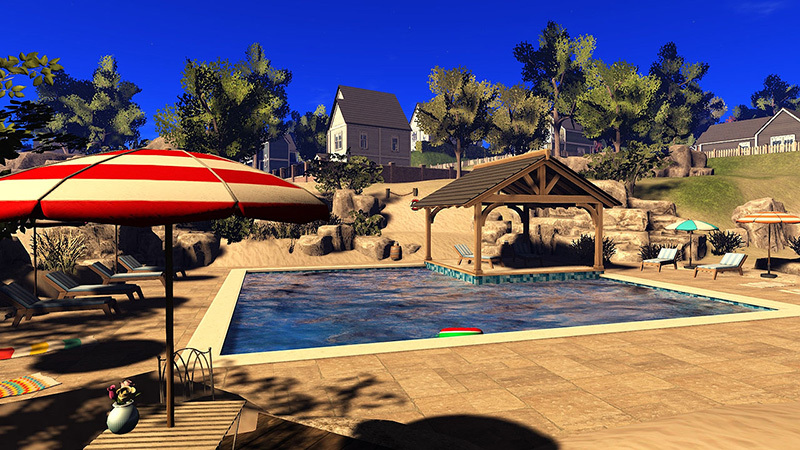 That would mean that Linden Lab has the rights to publish and sell such material. They don't have to get your permission. They don't have to pay you anything. 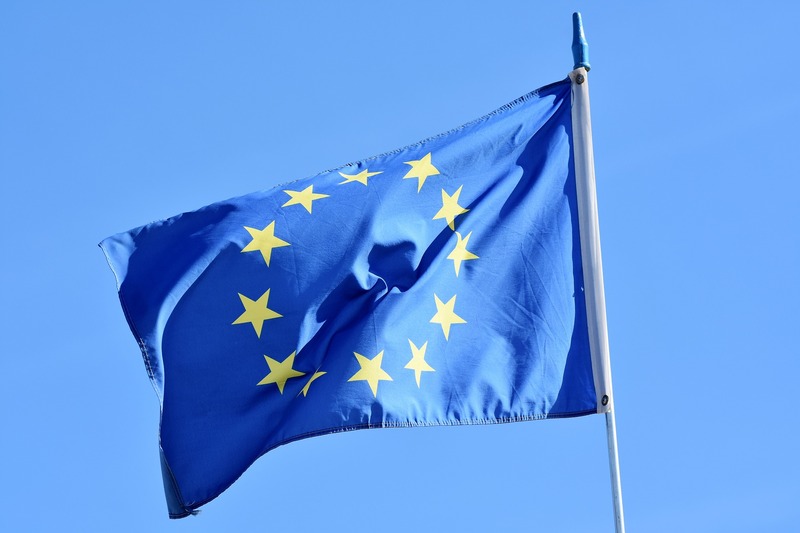 Consider how the TOS will affect exclusive rights to distribute your production. If you want to sell your SL-derived production to a distributor get a legal opinion. 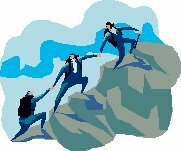 Try to get LL to waive its possible claims on selling your production. Or move your production to another grid. How does something that might be so become an immediate problem? Inworld Review is a regular show about happenings in the virtual world. Long. Backup, export and import your objects. 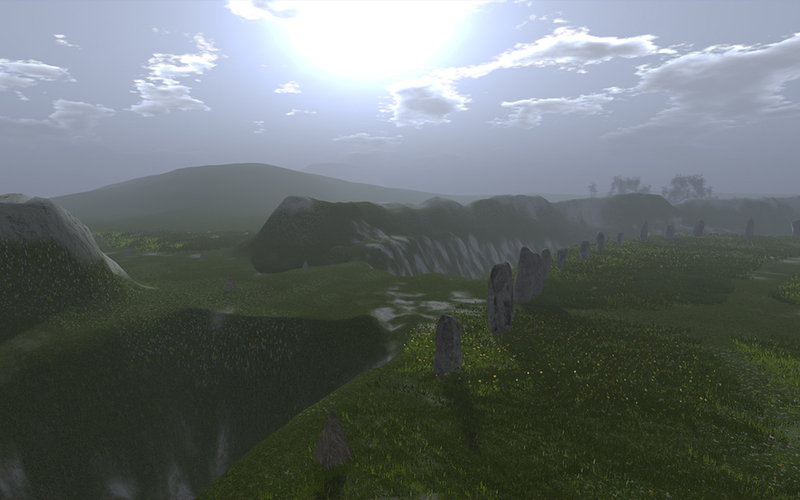 Explore Opensim and the Hypergrid. Get special features for content creation and other things. 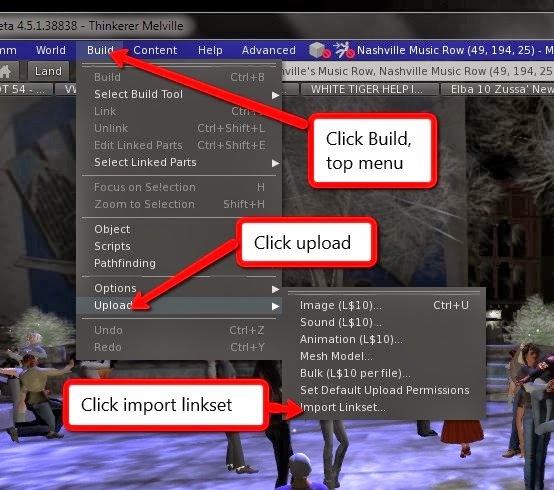 Illustrated instructions on how to start exploring Opensim with Firestorm for Opensim. These instructions apply to Firestorm 4.5.1 or later. They may not apply to earlier versions of Firestorm or to other viewers. Firestorm has an easy way to handle accounts on several grids. Click here to get an account at Kitely. Keep your user name and password handy. You will need those to set up your login on Firestorm. Caution: If you make up a password, keep it to less than 10 characters. Some viewers may cut longer passwords and so make the login fail. 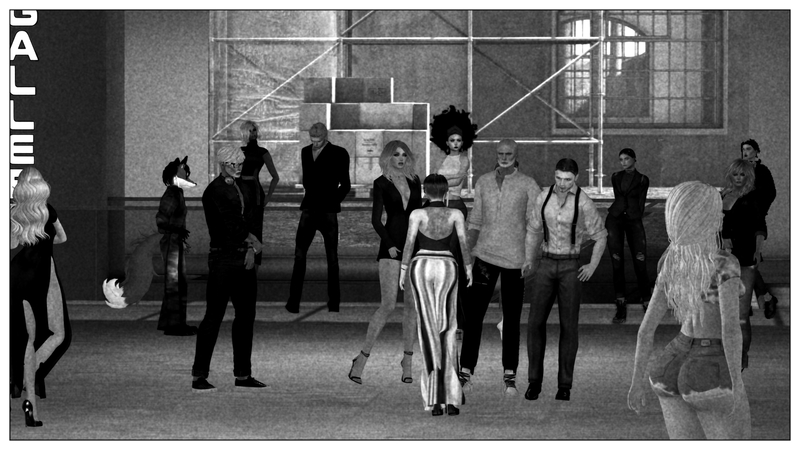 "Second Life is... a meeting of minds for creative folks!" -- Scott Rolfe, Austin, Texas based assemblage artist. Scott Rolfe embraces the unique possibilities of Second Life not only by making beautiful things but also by socializing: the vibrant international arts community in SL is reminiscent of college life, says Scott - giving and receiving feedback, critiquing one another with respect, a collaborative environment that fosters free expression rather than the usual competitive winner-takes-all philosophy so prevalent in many areas of modern life. Get on 'yer plaids and swipe the steam away from the haggis, it's Burns Night again! 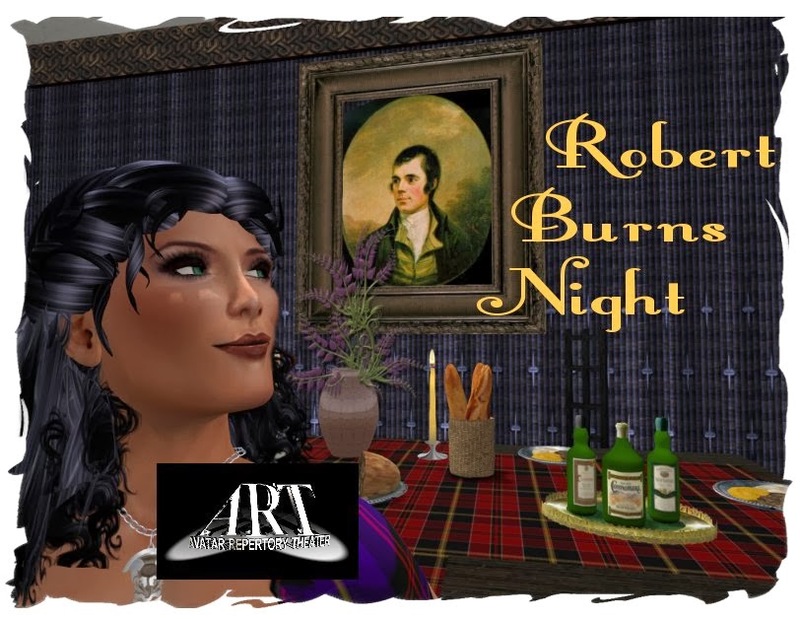 Avatar Repertory Theater celebrates Scotland's "favorite son," 18th Century poet, lyricist, social and political raconteur Robert Burns with poems and songs from his vast canon. Featuring Corwyn Allen, Rowan Shamroy, Breyda Adored, and Caledonia Skytower. 2014 IPRIGHTS: TOS: UCCSL: Where do we stand? Summary for January. TOS. UCCSL. Where do we stand? Summary of events and positions on the current LL terms of service. 62 pages there. New posts almost daily. Some give LL more time. Some have stopped producing new content. 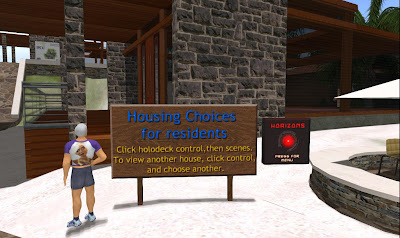 2014 PROMO: GROUPS: Google communities and Facebook groups: could they replace inworld groups? Could they replace inworld groups? Social media groups can do a lot more than groups in a virtual world grid. Inworlders= people in a virtual world community. 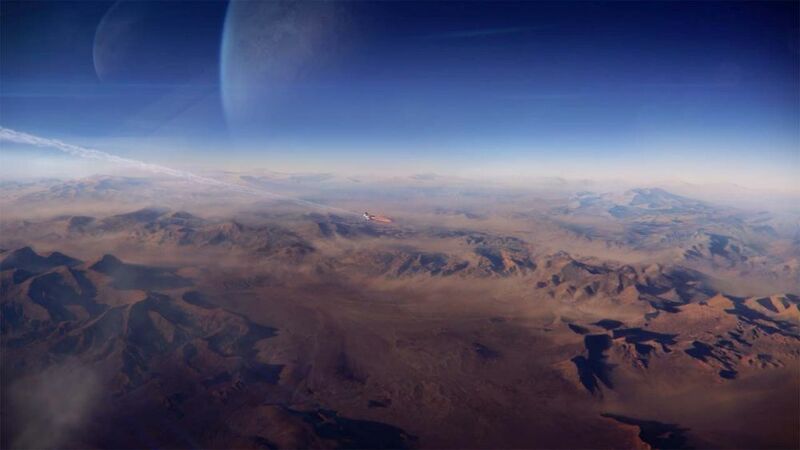 Outworlders= people in an ordinary world community. Maybe not replace. Augment. Extend. Expand. Let people people walk through all your houses -- use a holodeck to present them. Eduisland displays housing choices in a holodeck. Move stuff from one grid to another. Fans of the mixed-reality variety show Be My Guest -- and those who have never had a chance to enjoy this program, are all invited to join the cast and crew for a big Season 2 launch. The party takes place at the iMoogi TV headquarters in the big theater. Macabre, satiric, with a little humor. COMING THIS FRIDAY! Sunday, January 19th marks the 205th Birthday of Mrs. Poe's fun-loving, bouncing baby boy! A.R.T. 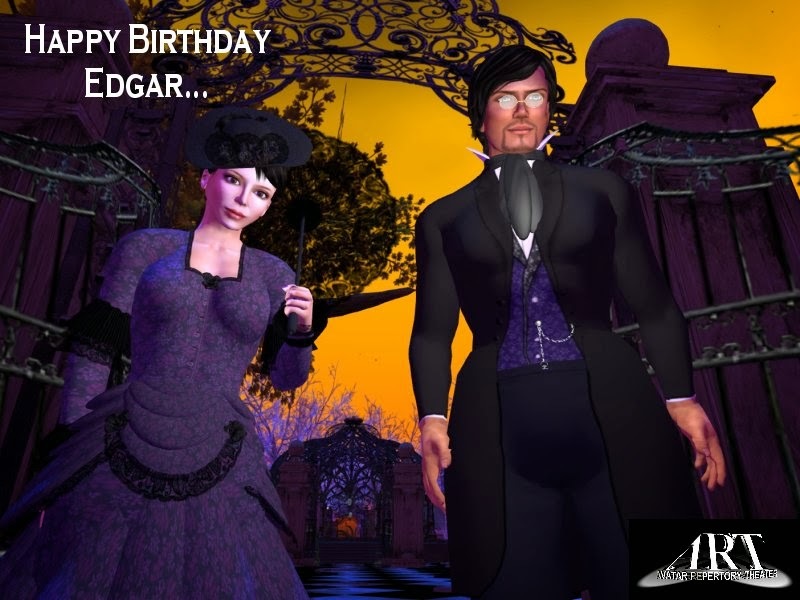 will celebrate on Friday at 5pm SLT with an evening of Poe presented Salon style, like the salons where many authors in the 19th Century read and promoted their work. Join us for an hour of the macabre and the satiric, laced with a little subtle humor. Hosted by Xenon Darrow/Virginia Dickenson, donated by Elumenata, Inc.
"The Learned Ladies" by Moliere. 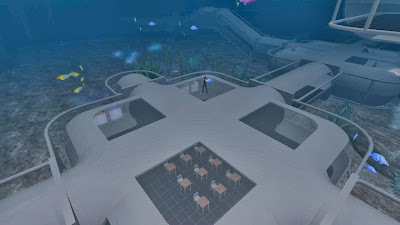 2014 EDU: OPENSIM: Undersea observatory. Pre-fab sim. Free. Displayed on Kitely. Undersea observatory. Pre-fab sim. Free. This sim is designed to be a discovery-based, constructionist learning experience, as students participate in scavenger hunts to document the aquatic wildlife, and contribute their own creations back into the sim for the benefit of future learners. Or run it on school computer if it has the Opensim software installed. Visit if you have a Kitely account. 2014 ART: EDU: Gem Preiz's 'A Cathedral Dreamer'--Fractals, Mandlebrot. This build has been so well covered by other bloggers and by videographer Art Kangem that I will merely provide links to the other coverage and to the gallery of Gem Preiz. Fractals in creative work and natural things. You can buy copies of this fractal art at the gallery of Gem Preiz art in Timamoon Arts. Some selected immersive education groups in Google+, Facebook, and LinkedIn. These are the ones I found that seemed to have visibility, membership (with people I knew), and focus on virtual worlds. 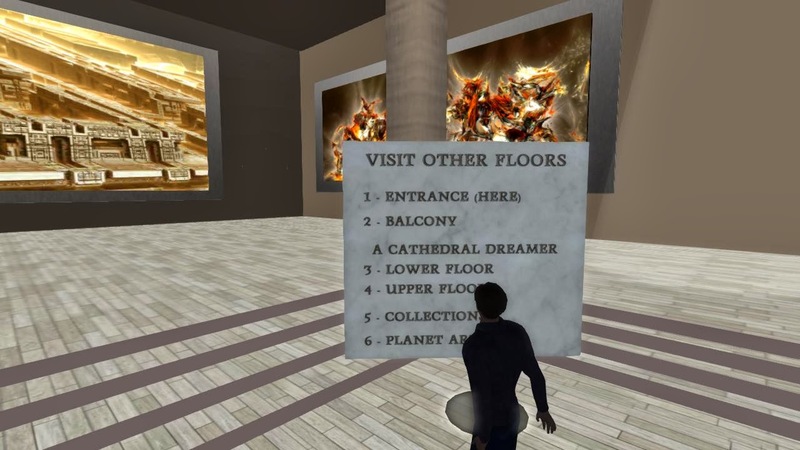 In the past, Second Life was the only virtual world with widespread interest. 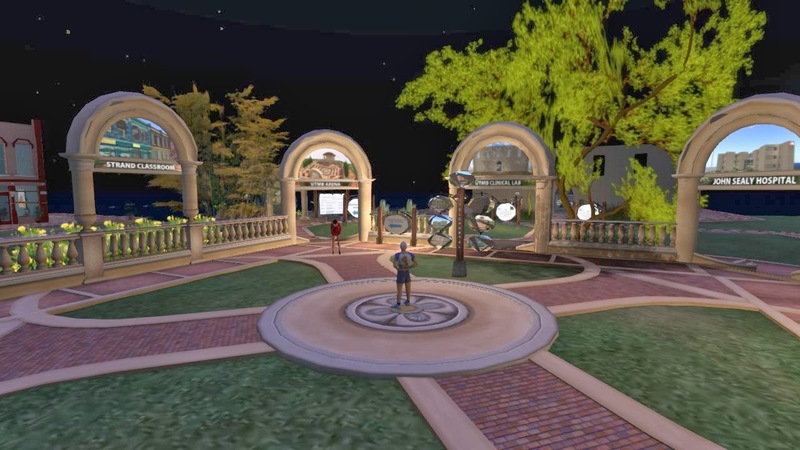 The educational community could live entirely within Second Life. Not any more. Opensim has grown to host many education communities in many grids. What these communities have in common is not location in a particular grid, but an interest in immersive education. These communities are now growing expanded contacts through social media. These social media connections are serving the same functions as educational groups used to serve in Second Life. But they support multi-grid communities that connect people who share interests, without regard to the grid they are using. That arrangement works especially well with Hypergrid, which supports travel from grid to grid. Here are some of the immersive education communities I found in social media. Feel free to mention others in the comments section; I expect update the main post later to add suggested groups to this list. 2014 STAGE: May the farce be with you. More Learned Ladies. Friday, Jan. 11 at 5 pm. California time. May the farce be with you. More Learned Ladies. Friday, Jan. 11 at 5 pm. California time. Will hapless father, Chrysale, ever get his over-bearing wife, Philaminte, and haughty eldest daughter Armande and dotty Aunt Belise, the so-called 'Learned Ladies', to stop imitating and fawning over every phony, self-aggrandizing pendant of 'Intellectualism'? Will Chrysale's youngest, sweet and smart Henriette, ever get to marry her true love, the wise and kind Clitandre? Or will she be forced to wed the greedy, puffed up con-artist Trissotin? These and more characters romp across the boards as the Avatar Repertory Theater continues the wacky saga of French playwright Moliere's "The Learned Ladies." MadameThespian Underhill directs and acts with Corwyn Allen, Em Jannings, Kayden Oconnell, Rowan Shamroy, Caledonia Skytower, Sodovan Torok and AvaJean Westland.